The Church of Jesus Christ of Latter-day Saints permits divorce, but the Church's focus on happy, sound, and even eternal families elevates marriage to a sacred covenant not to be lightly dissolved. For those headed to the altar this summer, the 1999 marital statistics for Orange County are sobering: 19,758 marriages, 12,156 divorces. And if you're a religious person, things don't get better. In fact, for born-again Christians, the divorce rate is higher (27% of all adults) than it is for non-Christians (24%), according to a recent survey by the Barna Research Group. The picture isn't rosier for other Christians or Jews. The survey showed their divorce rates about the same as the national average. There is a ray of marital hope, however. And that comes from the Church of Jesus Christ of Latter-day Saints--specifically, from those Mormons who marry in a temple. While other Mormons divorce at the usual rate, only 6% of those who undergo the demanding temple marriage break up, according to Brigham Young University professor Daniel K. Judd. When men and women marry, they make solemn covenants with each other and with God. Every effort should be made to keep these covenants and preserve marriage. When divorce occurs, individuals have the obligation to forgive rather than to condemn, to lift and to help. The sanctity of marriage and families is taught repeatedly in the scriptures. It has been reaffirmed by modern prophets and apostles. Despite the truths taught about the sanctity of marriage, divorce has become commonplace in the world. Because the family is central to Heavenly Father’s plan for His children, Satan seeks to destroy marriages and families. Because of the poor choices and selfishness of one or both marriage partners, marriages sometimes end in contention, separation, and divorce. Those who have caused a divorce through their own poor choices can repent and be forgiven. Those whose marriages have failed because of what others have done can receive strength and comfort from the Lord, who promised: ”Come unto me, all ye that labour and are heavy laden, and I will give you rest. . . . For my yoke is easy, and my burden light” (Matthew 11:28, 30). It is a scene of great beauty when a young man and a young woman join hands at the [temple] altar in a covenant before God that they will honor and love one another. Then how dismal the picture when a few months later, or a few years later, there are offensive remarks, mean and cutting words, raised voices, bitter accusations. :Modern prophets have warned that looking upon marriage “as a mere contract that may be entered into at pleasure … and severed at the first difficulty … is an evil meriting severe condemnation,” especially where children are made to suffer. The kind of marriage required for exaltation—eternal in duration and godlike in quality—does not contemplate divorce. In the temples of the Lord, couples are married for all eternity. But some marriages do not progress toward that ideal. Because “of the hardness of [our] hearts,” the Lord does not currently enforce the consequences of the celestial standard. He permits divorced persons to marry again without the stain of immorality specified in the higher law. Unless a divorced member has committed serious transgressions, he or she can become eligible for a temple recommend under the same worthiness standards that apply to other members. I strongly urge you and those who advise you to face up to the reality that for most marriage problems, the remedy is not divorce but repentance. Often the cause is not incompatibility but selfishness. The first step is not separation but reformation. Divorce is not an all-purpose solution, and it often creates long-term heartache. A broad-based international study of the levels of happiness before and after “major life events” found that, on average, persons are far more successful in recovering their level of happiness after the death of a spouse than after a divorce. Spouses who hope that divorce will resolve conflicts often find that it aggravates them, since the complexities that follow divorce—especially where there are children—generate new conflicts. ↑ Salt Lake Tribune, Bob Mims, "Mormons: high conservativism, low divorce, big growth," 1999-MAR-6. ↑ "Holy Matrimony:In Era of Divorce, Mormon Temple Weddings Are Built to Last," by William Lobdell, Los Angeles Times, 8 April 2000. 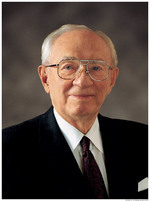 ↑ Gordon B. Hinckley, “The Women in Our Lives,” Liahona, Nov 2004, 82–85. 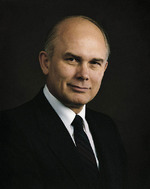 ↑ Dallin H. Oaks, “Divorce,” Ensign, May 2007, 70–73. ↑ Teachings of Presidents of the Church: Spencer W. Kimball (2006), 194. This page was last edited on 21 May 2011, at 00:50.